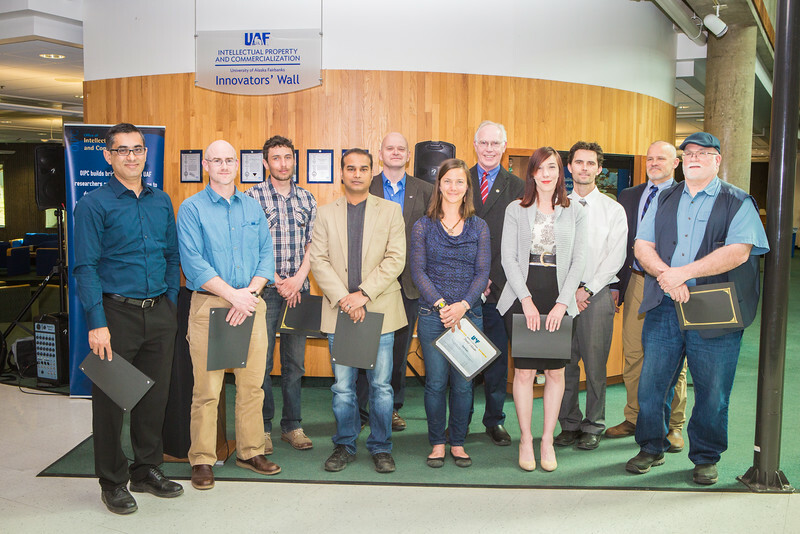 Winners of the 2016 Invent Alaska awards gather with Vice Chancellor of Research Larry Hinzman, fifth from right, and Mark Billingsley, Office of Intellectual Property and Commercialization contracts director, third from right. The winners, from left, include Rajive Ganguli, Rob Rember, Simon Filhol, Tathagata Ghosh, Rich Collins, Heidi Rader, Mindy Courter, Robert Coker and James Long. The competition was held by the UAF Office of Intellectual Property and Commercialization.